Sometimes small opportunities, when embraced, have a broader influence than one might first imagine. Just such an opportunity emerged nearly a quarter of a century ago and continues to influence my work as an architect and researcher today. As a student I found myself, quite by accident, working in a small design firm focused on residential design in Adelaide, Australia. The majority of our clients were housing cooperatives, a niche form of social housing in South Australia at the time. In brief, groups of households were facilitated by the State Government social housing agency to form legal cooperatives and, after adequate training, were funded to develop housing for their own use as tenants. We built multiple buildings under this model, ranging from groups of four dwellings to multi-unit projects of around twenty. The cooperative members effectively commissioned their own developments, finding a plot, employing their selected architect and preparing their own design brief. Residents also collectively held the responsibility to manage the resultant properties. Coop members were tenants, they were each other’s landlords, and they were administrators, collecting rents, managing finances and maintenance, and, of course, managing the challenges of living together over time. Before long I found myself joining a group. A home was designed and built to suit my households’ needs in the centre of the City of Adelaide. All members worked together on site over many weekends contributing ‘unskilled labour’ to the project, or as I saw it, getting our hands dirty building our common futures. Before completing architectural studies, I was living in an affordable rental property with eight neighbours I had come to know and admire through the long process of design and construction. Physically, we shared laundry, storage and garden spaces. Socially, we shared meals, supported each other through life’s challenges and celebrated each other’s joy. Shortly after moving to our completed houses, my new-born daughter became the youngest resident of the coop and it was an ideal environment in which to spend her childhood. Life moves on, and 12 years later we found ourselves moving on also. It was definitely a challenge to leave behind the environment we had collectively created and the social fabric which had grown around it. That is not to say living together was always smooth. We definitely had to tackle some social and organisational difficulties. Living in the cooperative I established an architectural practice and taught at university; eventually becoming an ‘accidental academic.’ Although no longer living in the coop, I find the experiences continue to permeate both my teaching and research. During my time in the cooperative, Australia experienced a property boom and is now one of the most unaffordable housing markets globally, with the average income to property value ratio in Melbourne and Sydney now exceeding that of London and New York. The resultant focus on houses as financial investment products and the dominance of large profit-seeking developers in urban housing provision has led to a miss-match between the housing available and the housing people need, or want. I began to question how could future residents collectively commission dwelling for their own use as we had done in the previous era of state-funded cooperatives. Importantly, I questioned how can we return to a focus on use values and liveability in preference to market values and profit. After following this course for some years in practice, teaching and research it was time to formalise the process and from 2013 to 2016 I completed a research thesis which asked “What are the impediments to collective self-organised multi-unit housing in Australia?” The research focused on both successful and unsuccessful attempts at collective self-organisation and drew on the range of international experiences mentioned by Darinka in a previous post here. In particular, lessons were drawn from self-development projects in Berlin, Germany and attempts to adapt those processes to the UK. 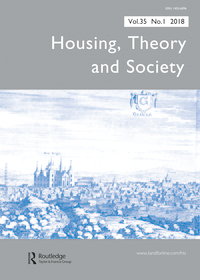 Post-PhD I continue to research emerging Australian experiences and learning lessons from international progress in the collaborative housing arena, with a focus on international comparison and policy transfer. The opportunity to visit the TUDelft CoLab as a guest researcher in 2018 has been an invaluable experience, allowing the expansion of this research to include the case of Dutch CPO/CPC projects. I would like to thank the many residents, built environment professionals, politicians, and municipality officers who have kindly agreed to participate in research interviews and shared their immense knowledge and experiences. With a plethora of new data now in hand, it is time to embark upon the process of analysis. Without wanting to predetermine outcomes, it is intended this research will not only inform Australia’s progress in this arena but also provide useful reflections and lessons to other collaborative housing markets, be they emerging or matured. Special thanks go to the members of the CoLab team and MBE for embracing and assisting my research in the Netherlands and I look forward to continued collaboration over time. Having now returned to Adelaide, it is saddening that my time in Delft has come to an end, but it was also a pleasure this week to return to my former coop home and share a meal with the current residents to celebrate the 21st anniversary of ‘moving-in day’. Image: ACRE Housing Cooperative Adelaide 1994-1997. Winner of the City of Adelaide award for Architecture 1998. Next Next post: Towards collaborative mat-hybrid housing. An experience for Co-lab.